The Position Paper offers a critical insight into the regulation police authorities, analyses provisions of the Police Order 2002 and investigates reasons for its ineffectiveness implementation on the ground. This Position Paper also delves into the constitutional debate on the powers of the federal and provincial legislatures to legislate on police governance structure. Though Police Order 2002 indicates a more clear structure for oversight and external police accountability, some important suggestions drawn out from the Draft Sindh Police Law that may be useful for democratic police reforms are also discussed. In order to address the weaknesses of the Police Order 2002, lessons from regional and international experiences have been discussed and recommendations for legislatures are provided to provide an impetus for positive change. This Paper has been developed as part of PILDAT’s initiative on Reforming Police, Prosecution System and Free Legal Aid Services in Pakistan. Under this initiative, PILDAT formed a six-member Committee of Expert on Rule of Law – Police, Prosecution and Free Legal Aid. 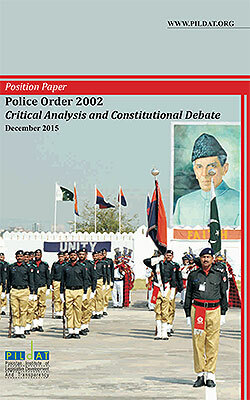 The Position Paper on ‘Police Order 2002: Critical Analysis and Constitutional Debate’ is authored by Mr. Muhammad Ali Nekokara, Member of Committee of Experts on Rule of Law (Police), and Former Senior Superintendent of Police (SSP). “Reforms in Rule of Law in Pakistan is supported by Development Alternatives Inc. (DAI) under the Enhanced Democratic Accountability and Civic Engagement (EDACE) project.